The Downton Abbey Carlton close coupled bathroom suite brings elegance and gracefulness into your bathroom with its period inspired styling. 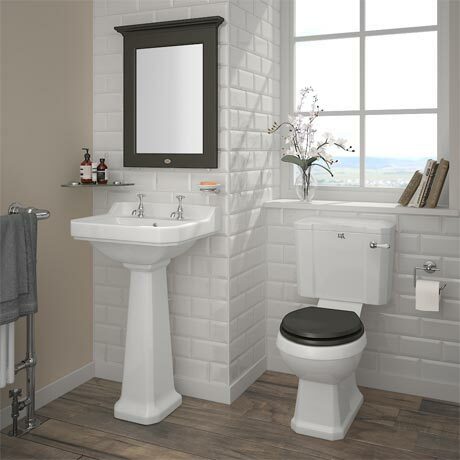 The suite comprises of a close coupled toilet with ceramic lever flush and Charcoal soft closing wooden toilet seat and a 560mm wide basin and full pedestal with an option of 1, 2 or 3 tap holes. All Downton Abbey sanitaryware is crafted to the highest standards and comes finished in classic gloss white. Please note - taps and waste not included.